as that of steel, the density would have to be 3,600,000,000 times as small as that of steel, that is to say, roughly speaking, about 50,000 times as small as the density of hydrogen, the lightest known gas. Evidently, then, a medium which propagates vibrations with such an enormous velocity must have an enormously high elasticity or abnormally low density. In any case, its properties would be of an entirely different order from the properties of the substances with which we are accustomed to deal, so that it belongs in a category by itself. 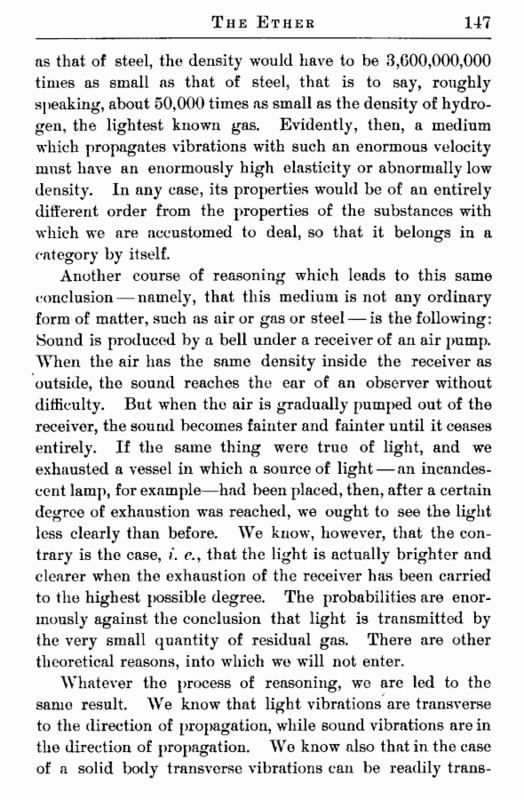 Another course of reasoning which leads to this same conclusion — namely, that this medium is not any ordinary form of matter, such as air or gas or steel — is the following: Sound is produced by a bell under a receiver of an air pump. When the air has the same density inside the receiver as outside, the sound reaches the ear of an observer without difficulty. But when the air is gradually pumped out of the receiver, the sound becomes fainter and fainter until it ceases entirely. If the same thing were true of light, and we exhausted a vessel in which a source of light — an incandescent lamp, for example—had been placed, then, after a certain degree of exhaustion was reached, we ought to see the light less clearly than before. We know, however, that the contrary is the case, i. e.> that the light is actually brighter and clearer when the exhaustion of the receiver has been carried to the highest possible degree. The probabilities are enormously against the conclusion that light is transmitted by the very small quantity of residual gas. There are other theoretical reasons, into which we will not enter. mittedf Thus, if we have a long cylindrical rod and we give one end of it a twist, the twist will travel along from one end to the other. If the' medium, instead of being a solid rod, were a tube of liquid, and were twisted at one end, there would be no corresponding transmission of the twist to the other end, for a liquid cannot transmit a torsional strain. Hence this reasoning leads to the conclusion that if the medium which propagates light vibrations has the properties of ordinary matter, it must be considered to be an elastic solid rather than a fluid. 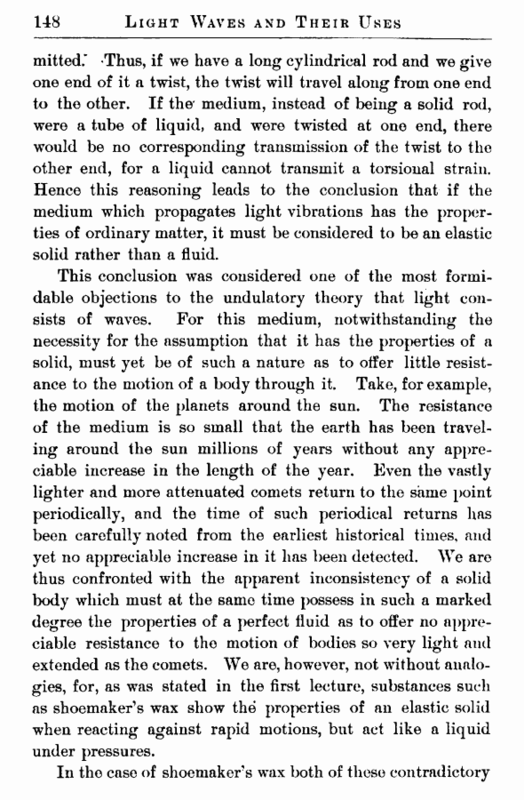 This conclusion was considered one of the most formidable objections to the undulatory theory that light consists of waves. For this medium, notwithstanding the necessity for the assumption that it has the properties of a solid, must yet be of such a nature as to offer little resistance to the motion of a body through it. Take, for example, the motion of the planets around the sun. The resistance of the medium is so small that the earth has been traveling around the sun millions of years without any appreciable increase in the length of the year. Even the vastly lighter and more attenuated comets return to the same point periodically, and the time of such periodical returns has been carefully noted from the earliest historical times, and yet no appreciable increase in it has been detected. We are thus confronted with the apparent inconsistency of a solid body which must at the same time possess in such a marked degree the properties of a perfect fluid as to offer no appreciable resistance to the motion of bodies so very light and extended as the comets. We are, however, not without analogies, for, as was stated in the first lecture, substances such as shoemaker’s wax show the properties of an elastic solid when reacting against rapid motions, but act like a liquid under pressures.